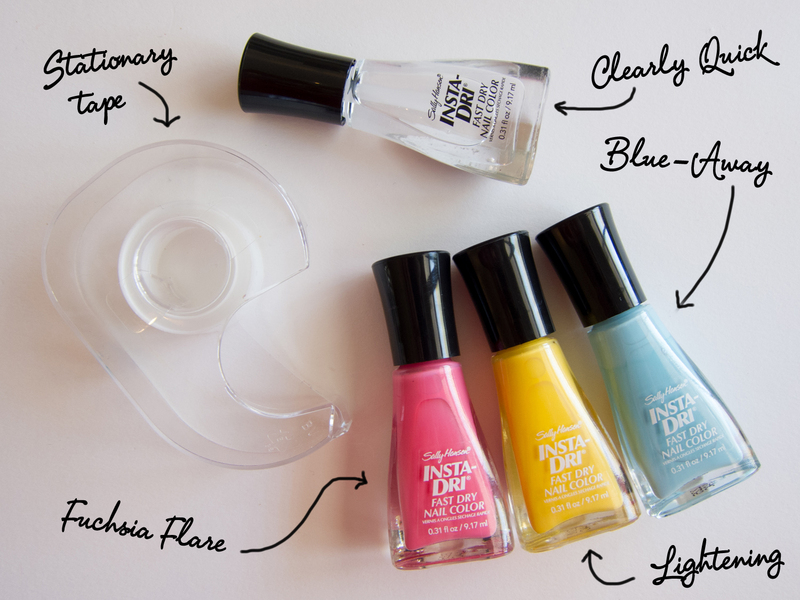 Today on Chalkboard Nails, I'm pleased to share another Sally Hansen I Heart Nail Art tutorial with you! I hope my look inspires to you to enter one of your manicures into the competition. This month's theme is "Color Blocking" and it is inspired by color and contrast. I was feeling particularly springy when I was gearing up to do this tape manicure, so I reached for three Insta-Dri shades in bright colors. I knew that I just had to include Sally Hansen Lightening in the mix -- I love yellow polish so much and I think it is quintessentially springy. Then, I paired Sally Hansen Blue-Away and Sally Hansen Fuchsia Flare with it, as well. If you're going to be recreating this manicure, you will also need a quick dry topcoat (Sally Hansen Clearly Quick) and some clear tape. Grab your popcorn, cause I've got a video tutorial for this look! Start by painting your nails with Blue-Away and let it dry completely. If you'd like, apply a coat of Clearly Quick to speed up the wait time. 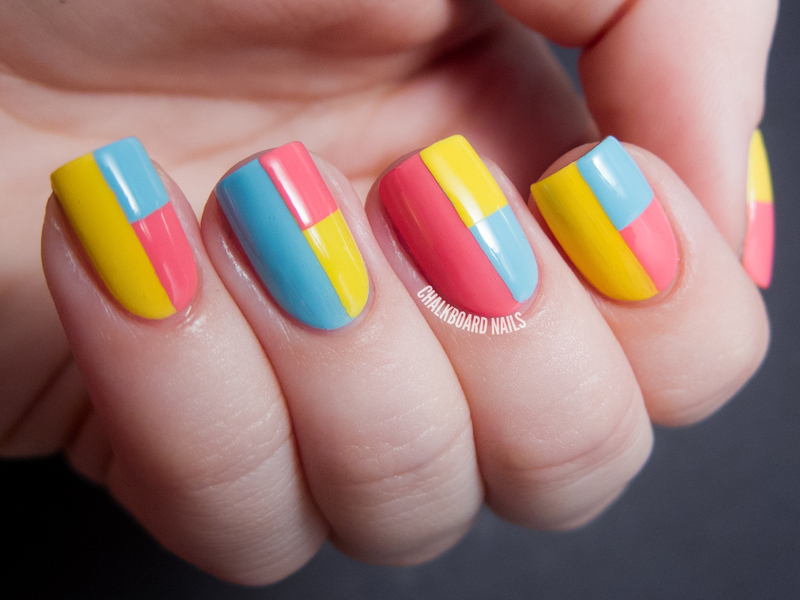 Once the polish is 100% dry, grab a piece of tape and place it vertically on your nail, dividing it in half. Paint over the exposed half of the nail with Lightening, being sure you overlap the tape line just a touch. Slowly peel off the tape, leaving a crisp line of polish down the middle of your nail. Before moving on to the next step, let the polish dry completely (again). Like in step one, if you want to speed up the waiting time, apply a coat of Clearly Quick. Paint half of your nail with Fuchsia Flare. If you did not add the optional piece of tape from step four, paint as carefully as you can to maintain the line dividing your nail in half vertically. Slowly peel off the tape. Let the polish set, then finish with topcoat. 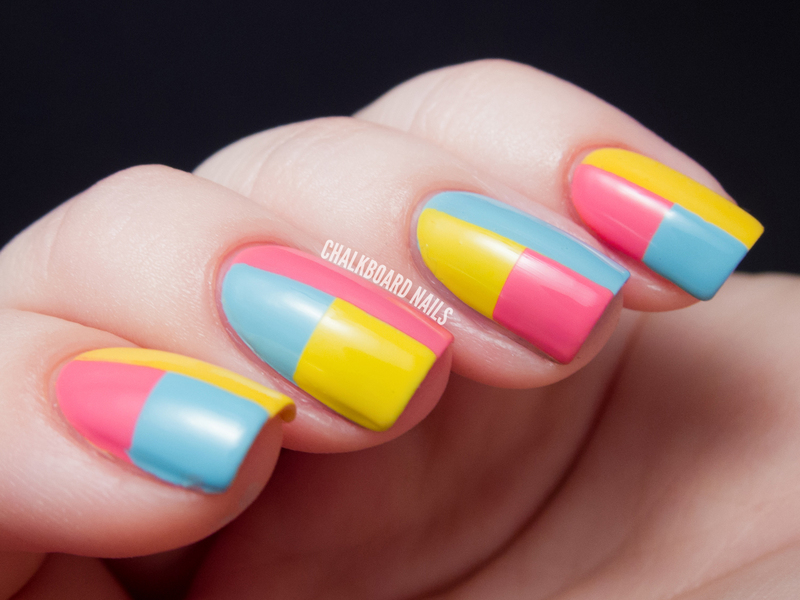 TIP: Feel free to change up the colors nail-by-nail! I rotated the three colors in my finished look and I think it really adds a lot to the manicure. 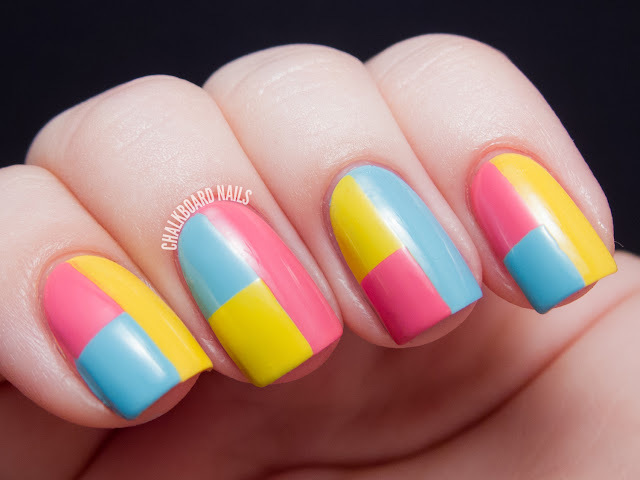 Stop by the Sally Hansen I Heart Nail Art campaign page & enter your color block look for your chance to win! I'll be watching the entries... I better see your submissions in there! Awesome! And it's so kind of you to take the time to do a video tutorial. Can I just say that I love your blog??? I definitely want to try this nail art, but I admire every aspect of your site, from the beautiful photography to the color combos you've tried. Chalkboard Nails has quickly become one of my favorite sites. Keep up the good work!!! I'm going to try to find this yellow that you have as the yellows that I have purchased previously are lacking in "denseness". They all seem to be see-through, so thank you! I /need/ this yellow in my life. The colours and pattern look really awesome! love it and the polishes look gorgeous together! Loving this! 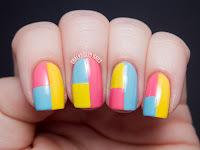 The geometric pattern is a nice change from the usual floral manicures for spring! I love this! I love how you these colors are pastel, but I can use them for Autism Awareness Month too (Autism is a puzzle piece of blue, red and yellow!) and in the this exact pattern too. I have such a hard time doing puzzle pieces, but this is an easier way to allude﻿ to the puzzle piece nature! I'm autistic and going to a benefit for Autism later in the month, so this will be perfect! Great tutorial! Love the colors you chose for the colorblocking. Amei seu blog!!!!! Já to seguindo aqui... Esse mani ficou linda e parece super fácil de fazer. Te espero lá no blog tb! I think I have all these colors, so I'm going to have to try this. Thank you for the beautiful tutorial. So good I can't wait to try it! This totally inspired me to try tape again - and it was a success, yay! I just love it, thanks for sharing.